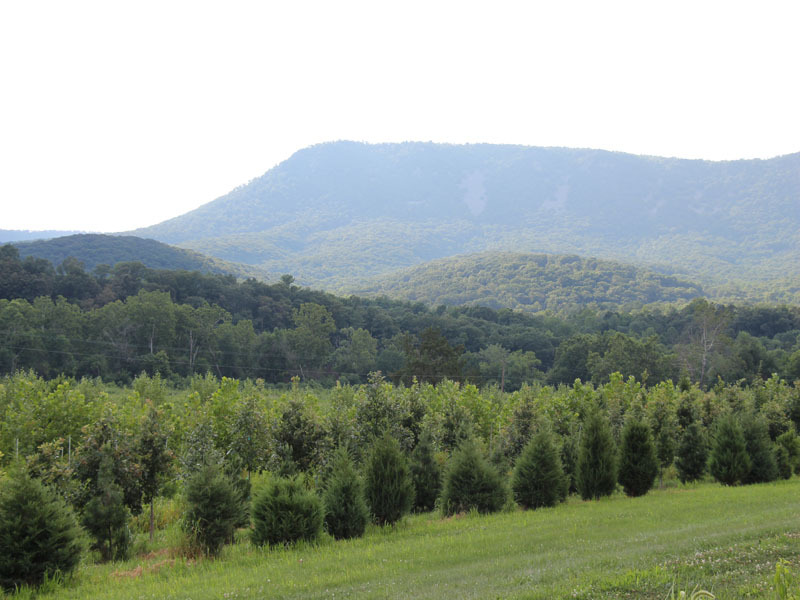 This last week in February*, the Shenandoah Valley has experienced record-breaking low temperatures, accompanied by blasts of frigid arctic wind whipping across fields and open land. In such conditions, evergreen trees and shrubs provide valuable wind breaks and protection for many birds, small mammals and livestock. 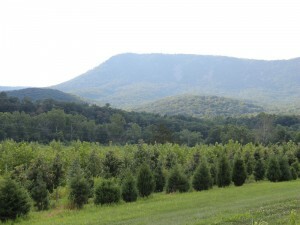 The common red cedar (Juniperus virginiana) is one such species, growing with hardiness unique to native flora. 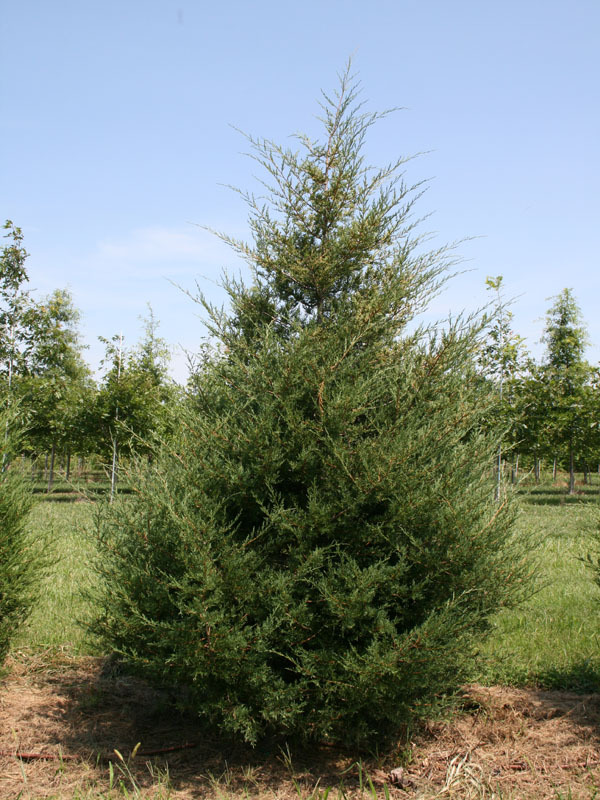 According to the Lady Bird Johnson Center Wildlife Center, the red cedar is the most widely distributed eastern conifer, native to 37 states. 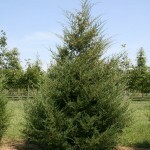 Eastern Red Cedar is resistant to extremes of cold, heat and drought. 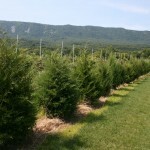 Ask many farmers to rank the value of the red cedar and the tree will not likely receive high marks. 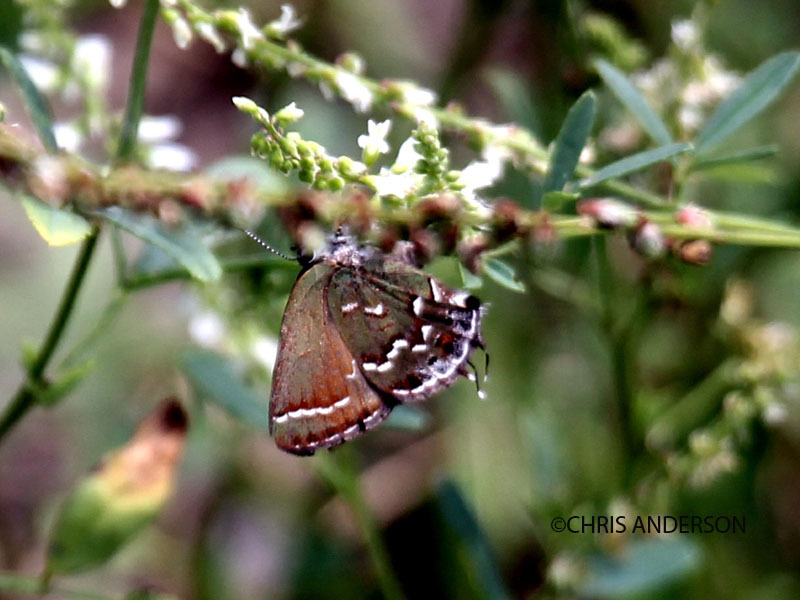 Though they are native to the eastern half of the United States, they can spread prolifically, growing with annoying regularity along fence lines and disturbing the clear vistas of many farm fields. The red cedar can also cause problems for orchard growers as they are a vector for a fungus known as cedar-apple rust which can harm and even kill fruit trees, particularly apple. The red cedar is many things to many people: Inquire of a craftsperson if it is good for wood working and some may say list it as their favorite with its striking interior patterns of pink heartwood and cream colored sapwood and its fresh fragrance. Historically, it was a favorite wood to use for wardrobes and trunks as the natural oils inhibited moths from infesting wool blankets and clothing stored within. Because of its rot-resistance, it was also highly valued by European settlers for fence posts and building material. Various Native American nations used the berries for flavoring and to help treat coughs. 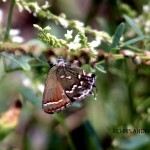 The oils are said to possess antiseptic qualities so can be used for skin ailments. 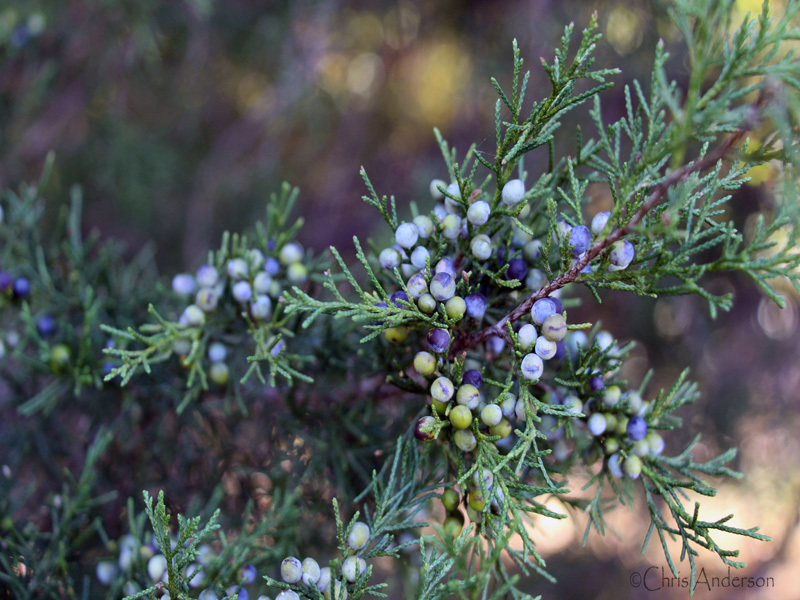 Despite its name, the eastern red cedar is not a cedar at all but is a juniper and what look like small round blue berries on the tree are actually cones. These cones are nutritious food for various birds, particularly the cedar waxwing. 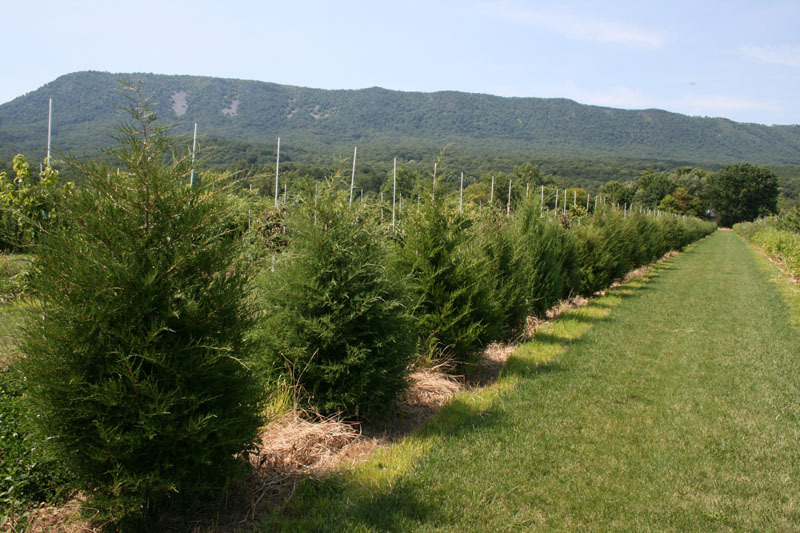 This could explain the common distribution of the eastern red cedar along fences as birds naturally “fertilize” the ground with the seeds by perching along the fence lines. The red cedar can be very long-lived with the oldest being almost 800 years old and living in Missouri. They typically average height of 40-60 feet but the state champion comes in at 68 feet tall and is located in Southampton, VA.
One of our favorite ecology guides is Doug Tallamy’s Bringing Nature Home. 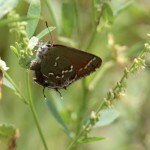 In his book, he lists the eastern red cedar as the host for the juniper or olive hairstreak butterfly (Callophrys gryneus), one of the species we see often in our summer butterfly counts at the White House Farm. 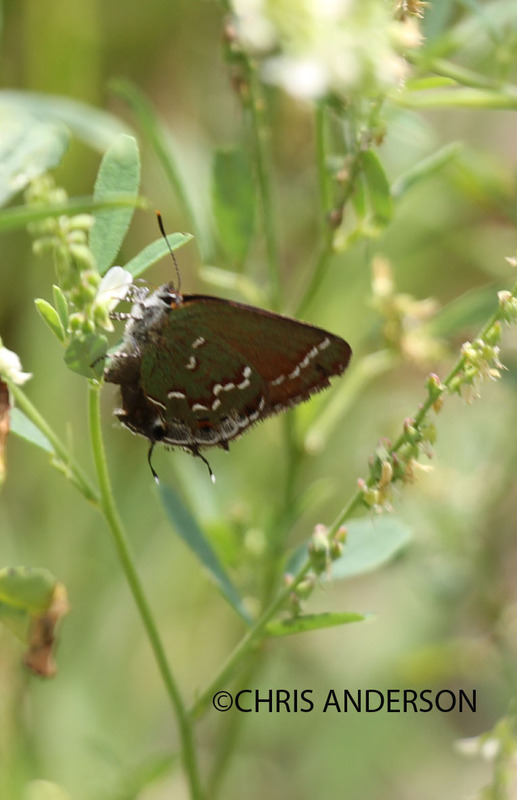 In fact, with our 2014 count, we spotted six of the eight total olive hairstreaks from the entire count area. 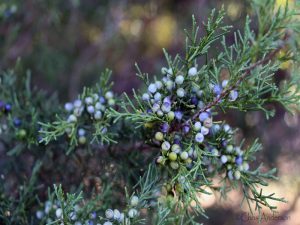 So for a hardy evergreen that can thrive on poor soils, consider the eastern red cedar as a species to add structure to the landscape and benefit bird and butterfly species.